Marc Freedman: I think we’re in the middle of restructuring what a life looks like in the context of much longer lives. You can’t just fold, spindle, stretch and mutilate a life course that was set up for 20th century life spans for 21st century spans that ultimately will last 100 years. You’ve got to rethink the whole process of education, of productivity, and balance the working lives over much longer periods of time as well as human capital development. via Reinventing Old Age: The Good We Do When We Work Forever | The Business Desk with Paul Solman | PBS NewsHour | PBS. Each one of us will experience the death of those we care about at various times in our lives. Each of us will grieve. The depth of that grief depends upon the relationship…the closer you were, the greater the grieving. One thing to remember when grief comes your way; the grief belongs to you, alone. Others will be there to console you and some will understand, but no one owns your grief. The point is, no one can tell you when, how and how long to grieve. Don’t let that happen. Own your grief; protect it, for grieving is loving. We’ve talked a lot about Commonplace Journals, and I thought it might be a good idea to show you mine. The purpose of a Commonplace Journal is to record items you need to remember, everything from the name of a book to an idea for a future art project. It’s not formal, it’s not meant to show to others or as a brag book. It’s your memory, your imagination, and the garden of your muse. To hold my Commonplace ideas, I bought a hand-made journal from Val Bembenek. She makes wonderful, traditional Japanese-bound journals, about 8-1/2 inches x 5-1/2 inches, with horizontal orientation. Val ties non traditional buttons on the front as decoration. She also uses paper bags as covers. (You can buy them from her via email, too.) 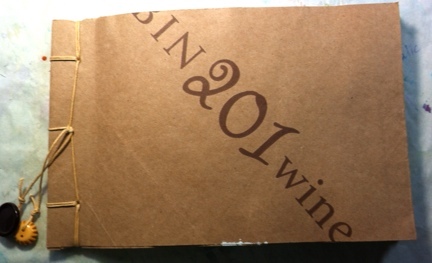 This one has a wine bag front cover and a bread bag back cover. Perfect combination! I have previously written posts about my Pop but today I needed to write once more, so forgive me for not having a ‘cheery post’ to submit tonight. I simply need to be able to talk about how I feel. I am watching my father decline rather rapidly. It is the most heart breaking thing I have had to witness (apart from having to hold my 16 year old dog as the Vet put her to sleep) and anyone who has cared for their elderly parents will know what I am writing about. This.. this is something almost unbearable to face. He will be 86 in July my dear Pop.